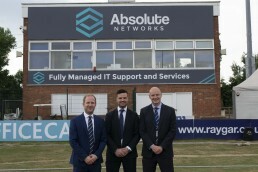 Find out how Absolute Networks are working with Derbyshire County Cricket Club to build an IT infrastructure that's fit for the future. Like many sporting venues, Derbyshire County Cricket Club has started to diversify its offer. From sell-out pop concerts to the BBC Tailenders match broadcast on the BBC’s red button in August 2018, there’s a lot more going on at The 3aaa County Ground than traditional cricket matches. To back this up, the club needs an IT infrastructure that’s fit for purpose; one that can support ticket sales, food, drinks and merchandise sales, televising events and generally keeping up with the expectations of a 21st century crowd. Enter Absolute Networks. We’ve worked with the club to enable staff to work more flexibly, enhancing productivity through a new suite of laptops. We’ve provided improved connectivity and speed, through a reliable network infrastructure. Their POS (point of sale) systems are up and running reliably around the ground thanks to new fibre optic links. Then there’s been the support we’ve offered for one-off events. We provided the BBC with a private network to support the broadcast of the BBC Tailenders match in August 2018. We were on-site when Little Mix performed to 15,000 fans in July 2018, meeting the IT demands of the promoters. There have been challenges too, like responding to the delay customers were experiencing when buying tickets to matches online. Thanks to our team’s considered troubleshooting, the root cause was found and rectified. Response times are back to normal. Essential for a club with a capacity of 5,000 for cricket matches. Going forward, we’re working with Derbyshire to build a network infrastructure that can support the growth and ambitions of the club. By laying good foundations, the infrastructure will respond to the demands placed on it. Being a Derby-based company, we’re able to give responsive on-site support. But that’s not the main benefit of this partnership. Our flexibility and our ability to look at their IT infrastructure in a holistic way means that we’re able to predict problems in advance and prevent them from occurring. Our experience in supporting businesses with multiple IT requirements like Derbyshire County Cricket Club means we know how to plan for future growth. For more information on how Absolute Networks can support your organisation, call 01332 291992.